Not only is the colour different, but there's a bit of a bump in the specs. An extra GB of RAM and double the storage now too. That premium spec and colour choice will cost an extra $100 over their non-black KEYone. 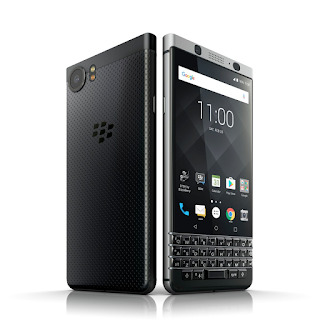 On the heels of the recent BlackBerry KEYone launch that has exceeded expectations and is now available in more than 30 countries, today in Berlin, TCL Communication is unveiling the BlackBerry KEYone Black Edition - the all new version of the award-winning BlackBerry KEYone. Features 4GB of RAM, 64GB of internal storage and supports microSD expandable storage up to an additional 2TB. BlackBerry KEYone Black Edition delivers on TCL Communication's promise to expand the BlackBerry smartphone portfolio in 2017, while laying the groundwork for another addition to our lineup this year. The new device will be available to Canadians for $799 CAD - proving that Canadians don't need to spend $1,300 for productivity, efficiency and security in a smartphone.